Roseville, CA- There are so many crossover sport utility vehicles on the roadways these days it’s hard to keep track of them all. Many of them are subcompact crossover SUVs, which are the latest craze among car buyers looking for versatility, a little sportiness, and a reasonable price. A year ago, the Hyundai Kona entered the scene. It’s a somewhat brash five-passenger, compact SUV that’s offered as a gas-powered version and also as an all-electric vehicle. This review will deal with the traditional Kona. Available in four trim levels (SE, SEL, Limited and Ultimate). the front-wheel drive 2019 Hyundai Kona was introduced a year ago as the smallest SUV in the South Korean manufacturer’s lineup, slotted just below the Tucson. It has a somewhat quirky appearance that includes split-level headlights and a very big grille. We’re fans of the optional turbocharged engine, the Kona’s sportiness and its generous amount of safety features. New this year is the Kona provides improved safety with standard features like forward collision warning, automatic emergency braking, lane keeping assist, and a handy driver attention monitor. The base engine is a 2.0-liter, four-cylinder that produces147 horsepower and 132 pound-feet of torque, and is mated to 6-speed automatic transmission. There’s nothing too exciting about the performance and the gas mileage (27-33 mpg) is only slightly better than the upgraded turbo model (28-32 mpg). The Kona turbo engine is a 1.6-liter, four-cylinder that generates 175 horsepower and 195 pound-feet, and is paired with a 7-speed dual-clutch automatic transmission. It’s quicker than many of its subcompact SUV competitors, going 0-60 mph in 7.2 seconds. All-wheel drive is an option with either engine. There’s a fun factor with the turbo model, thanks to its spunky performance. And overall the Kona provides sporty handling, showing composure on tight turns and solid maneuverability on challenging roads. It’s a comfort to know that the Kona has a lot of safety features that will keep its driver alert to any possible danger. Overall, the Kona interior receives good marks. It has a logical set up in regards to controls, isn’t loaded with too many plastic materials, and has fairly good storage. Standard features include a 7-inch touchscreen infotainment system, six-speaker audio system, and Apple CarPlay and Android Auto smartphone integration. The climate controls are conveniently located and easy to grasp. The logical arrangement of the cockpit should please the masses. The overall seating is a little stiff and could be bothersome on long drives. Tall drivers and passengers will have few issues with height. Besides some conveniently located storage areas, the Kona has a cargo area that measures 19.2 cubic feet and expands to 45.8 feet with the second row folded down. 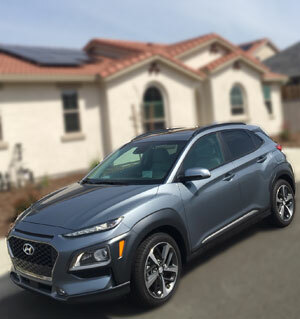 The 2019 Hyundai Kona is a smart buy if one is in the market for a reasonably-priced subcompact crossover SUV with good versatility. Competitors include the Honda HR-V, Mazda CX-3 and the Nissan Kicks.